It is the dawning of a new era and the world is changing. The ridged confines of the Victorian and Edwardian eras are on their way out as England ushers in the modern age. The Buxton sisters and their adopted ward have just lost their father and are struggling with their grief. The eldest daughter, Rowena, is faced with the burden of providing for her younger, sickly sister Victoria and their ward Prudence. She is entirely overwhelmed and doesn’t know if she is suited for the task ahead of her but she is willing to try. Before the funeral is at a end, their uncle, the Earl of Summerset and his solicitor, approach Rowena to read her father’s will and it is discovered that the Earl is to control their entire estate and plans on selling their house, she has never felt more helpless. Rowena and Victoria are to live with their uncle and his wife at their illustrious estate, Summerset Abbey, until such a time as they both find suitable husbands. The Earl plans on leaving Prudence with nothing but Rowena makes a snap decision that will change everything….she tells the Earl that Prudence is their ladies maid and must accompany them to the Abbey. When the girls arrive at Summerset Abbey, they are quickly separated….Victoria and Rowena have lavish rooms while Prudence is deposited in the drafty servants quarters far away from the sisters she has loved so much. As the days and weeks go by it becomes more and more clear that the sisters may not ever be returning home to their London estate….ever. While at the Abbey, the sisters meet a group of friends that call themselves the Cunning Coterie, an exclusive social circle of aristocratic “rebels”. These young men and other women, are all feeling the suffocating pressure of society and long for something new, different, and modern….unconventional. While the sisters are mingling with their peers, Prudence is busy trying to fit in with the younger group of servants below stairs. The other servants treat her like an outcast because she was brought up the same as the Buxton sisters…educated with money. She was never meant to be in service and she is scorned for it. The only servants who shows her any friendship are Susie the scullery maid and Andrew the footman/chauffeur. But when one of the aristocratic rebels start showing and interest in Prudence, her heart is torn even more so between the two worlds in which she lives. Meanwhile, Rowena has just leaded some devistating news that she can’t bring herself to share with her sisters. While Rowena is worrying herself sick over what to do, Victoria is hot on the trail of a huge secret that could scandalize the entire Buxton family ruining them forever. As the holiday season approaches, tensions are at a boiling point and something must give. At the Abbey, the girls struggle against the constraints of society and the devision of the classes…..or in this case the upstairs/downstairs world of the Edwardian era. It is an ever present theme in this book that influences the lives of all the characters. Reading about the three different girls was very compelling. They were all so different from each other but struggled with many of the same issues (classism). As the eldest girl in my family, I immediately was drawn to Rowena and found myself wondering what I would do if I were in her position….but my spirit leans more toward Victoria, and I am proud like Prudence….so in essence, I was drawn to each of the characters for different reasons. I liked that the story had alternating POVs which allowed us to see the plot from many angles. I also loved reading about the downstairs world and their lives compared to the society characters. This book will really appeal to Downton Abbey fans without question. I liked that the novel ended but left a lot of room for future books….important questions were answered but larger story lines were left open. I am very excited for the next book to come out. I loved the romances that are developing. We get little hints of what is to come in future books with the romances. There was enough to keep the reader interested but enough left out to make you want to read more! I did struggle with the beginning of the book though. For me it was a little slow to start. I thought less time should have been spent setting up the household dynamics and introducing the household characters and more time put into the development of the ‘secret’ and the antagonist. For me, the Earl and his wife were a little bland as the antagonists….I would like the see them become more unlikeable in future books…..for me they were a little too likable, like the reader could excuse them of their wrong doings which I suppose is ok, but I wanted a little more conflict from them. The ending almost had it, but I would have liked to see a little more ‘umph’ if you will. It had the right mix of scandal, romance, drama, and upstairs/downstairs politics to keep audiences reading….as the story went on I had a more and more difficult time putting my bookmark in it. It was not an overly complex saga, but it is a jolly read that will leave audiences longing for more. 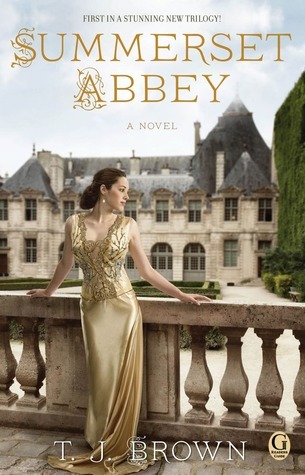 Just like Downton Abbey, Summerset Abbey could easily be a runaway hit! Hold onto your corsets readers…..the dawning of a new era is upon us! His voice had taken on a world-weary tone that she disliked, as though he’d searched the world over for something of interest and had been sorely disappointed. If you were sickly you either overcame it or it overcame you. It gave one a sense of strength. Yes I thought it just needed a little ‘something’ extra….it just wasn’t enough for me unfortunately.